There was a small building close to the driveway with a closed door. I opened the door to find a small circle of people dancing and laughing in an open structure of two walls, a wood floor, and a ceiling. The other two sides were open to the outside, but from the front, it looked like a cottage. Forgive this terrible photo under bad lighting. This is the salsa dance at Z-Land on Friday nights. The bench and corners of the walls were made of polished tree trunks or slabs. I had been told that Zephyr was a custom builder and woodworker. He had made a friend’s stairway with clever alternating steps. We arrived in time for the beginner dance lesson, which was intimidating because all the beginners were dancing fluidly. Then I found out, none of them were beginners. They were all enthusiastic salseros who had missed dancing salsa, because it had been put on hold for several months. They held some beginning lessons with slow music, adding more and more beginning dance steps until it became hard to keep track of them all. Luckily, all of the lead partners knew what they were doing so I was always being aimed the right way. So as long as I could remember that the count, “1 2 3 (pause) 5 6 7 (pause),” I could at least step forward on 5. The move I could never seem to remember was Enchufle – which looks like a sideways switching of partners, and has questionable meanings in English. One translation means “connect with her” and while it doesn’t describe what to do, at least all the lead partners knew which direction to move. Since there were an odd number of people, my friend Dawn alternated turns dancing or standing. Luckily she has been salsa dancing for years, so she was able to help guide my steps. 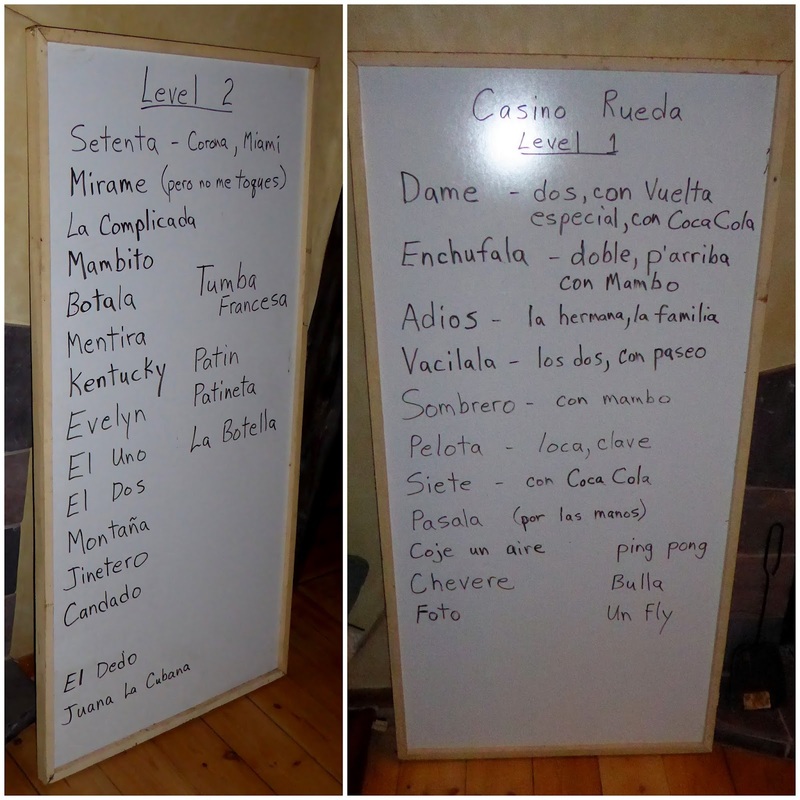 Salsa rueda steps or movements for beginning or more advanced students. Cuban style salsa is different from other salsa styles in being circular, with a sideways switching of partners. The salsa I learned years ago was more like a ballroom dance style, in which a pair of dancers is partnered together and moves forward and back in a more linear fashion. Salsa rueda is group oriented and doesn’t take itself very seriously with inventive moves and frequent switching of partners. The basic salsa dance step was different from what I remember, but not too difficult. Just ask all the dance partners whose shoes I stepped on! Like other ballroom dances, there is still a lead partner – usually male, and a following partner – usually female. The lead partner controls the flow and directs the follower into twists and turns. The rhythm used for Cuban salsa is: “1 2 3… 5 6 7…” as opposed to “1 2 3 4 5 6 7 8.” The 4 and 8 counts were silent pauses. Below is an Instagram video, which will hopefully show up. Foto – when the announcer calls foto, the men pretend to take a pose, while the women pretend to pose for a photo. Unless you prepare and know what you’re doing, the foto takes you by surprise, so the poses make everyone laugh. Fly – the men pretend to catch a fly ball landing inside the circle, so they lean inside and clasp their hands overhead while the women pretend to catch a fly ball landing outside the circle. Bulla – this means noise. At the right time, both partners stamp their feet in unison. Chevere – It’s like the dance, “The Twist.” Both partners gyrate their pelvis and twist their knees to the left and right, opposite each other. 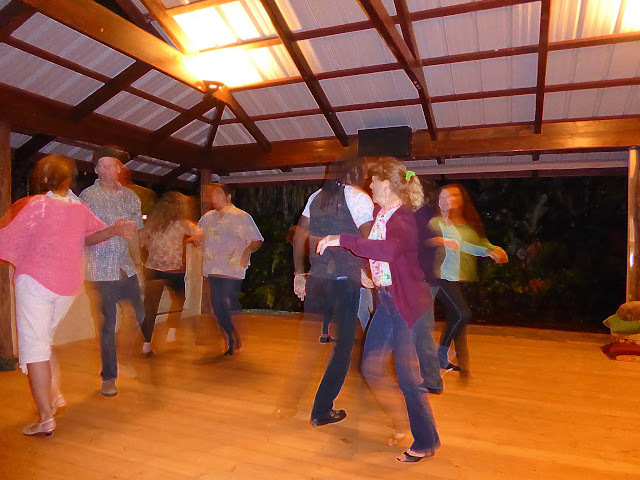 For more information, visit Maui Salsa for dance times, instruction, and directions. Zephyr also gives private salsa lessons, phone: (808) 572-6127.